This species is native to China (Anhui, Fujian, Guangdong, Guangxi, Guizhou, Hebei, Henan, Hubei, Hunan, Jiangsu, Jiangxi, Shaanxi, Shandong, Sichuan, Yunnan and Zhejiang), and Taiwan, where it grows on the cliffs, the hilly slopes and along the rivers up to about 1200 m of altitude. 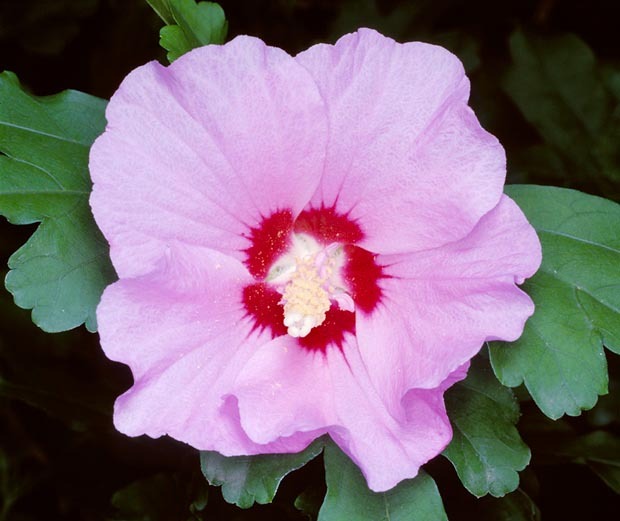 The name of the genus comes from the Latin “hibiscum”, name utilized by Pliny (23-79) for indicating the Althaea officinalis, in its turn descending from the Greek “ibiskos”, referred to some Malvaceae. The Latin name of the species, “syriacus”, refers to Syria, its supposed place of origin. Common names: rose-of-Sharon, shrub-althaea, Syrian hibiscus, Syrian ketmia, Syrian rose (English); mu jin (chinese); hibiscus de Syrie, mauve de Syrie (French); altéia-arbustiva, hibisco-colunar, hibisco-da-Siria, rosa-de-sharão (Portuguese); rosa de Siria (Spanish); Echter Roseneibisch, Syrischer Rosen-eibisch (German). The Hibiscus syriacus L. (1753) is an erect deciduous shrub, tall up to about 4 m, much ramified, with ashy grey coloured bark. The leaves are alternate, dark green and of variable shape, from rhomboidal to triangular to lanceolate, entire or variously tri-lobed, with irregularly dentate edges, smooth on the upper page, at times pubescent along the nervations below, 3-10 cm long and 2-4 cm broad. The solitary flowers, simple or double, come out at the axilla of the leaves in the terminal part of the branches, have epicalyx (involucrum of bracts similar to sepals placed under the calyx, typical of the Malvaceae), with 6-8 thin lobes, 0,5-2 cm long, pubescent, 1,5-2 cm campanulated calyx, pubescent, with five lanceolate lobes, campanulated corolla of 5-6 cm of diameter with obovate, 3-4 cm long and 2-3,5 cm broad, petals, violet-blue, purple, white or pink, with at times darker centre, and 3 cm long staminal column. The fruits are ovoid, pubescent, yellowish, 1,5-2 cm long, capsules, of 1,2 cm of diameter, containing several reniform seeds, 2-4 mm long, having a row of long, yellowish-white hairs along the dorsal line. It easily reproduces by seed or by semi-woody cutting at the beginning of summer, if we want to be sure to reproduce a particular variety. It easily self-disseminates and in many locations is considered as a pest. Species easily cultivated and with a long summer blooming, it is one of the most popular garden plants, in its quite numerous varieties, in particular in the temperate climate zones, as it may resist to temperatures going to -20 °C, and even less, with a good mulching at the base. 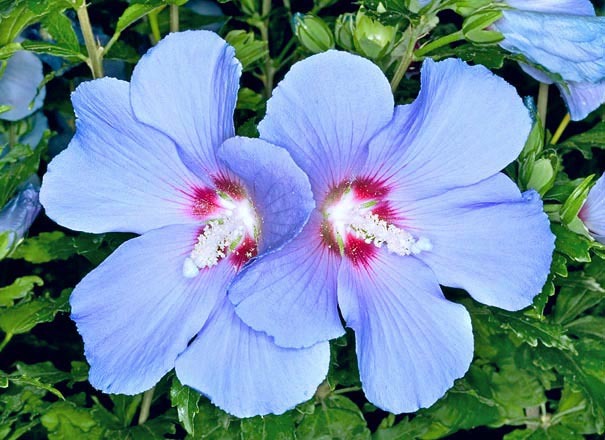 It can be cultivated in full sun as well as in partial shade and is not particular for what the soil is concerned, even if it better grows in the fertile, deep and well drained ones. It fairly well resists to the salty air and therefore can be employed near to the sea. It bears the pruning, even if drastic, to be done in spring, which help in keeping compact the vegetation and in stimulating the flowering. 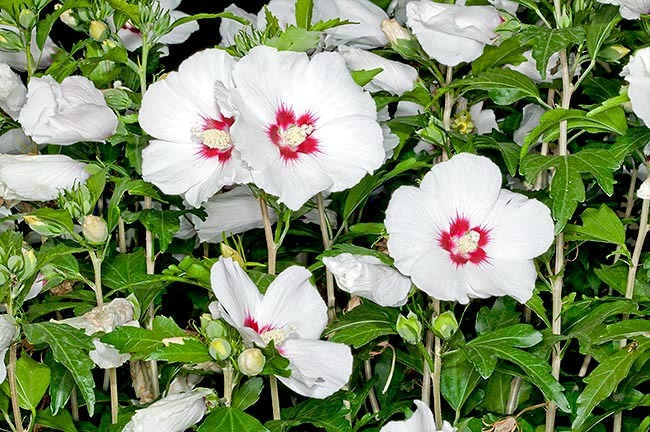 This Hibiscus can be employed in groups or as isolated specimen, also in shape of small tree with the necessary pruning, or for hedges and mixed borders. It is easily subject to aphids attacks and has the disadvantage of keeping for long time the withered flowers on the plant. Synonyms: Althaea frutex Mill. (1768); Ketmia syriaca (L.) Scop (1772); Hibiscus rhombifolius Cav. (1787); Ketmia syrorum Medik. (1787); Ketmia arborea Moench (1794); Hibiscus floridus Salisb (1796); Hibiscus acerifolius Salisb. (1805).